Clubs, discos and parties will take on a whole new “atmosphere” when DJs and entertainers unleash the spell-binding psychedelic power of the new Atmospheric RG LED from American DJ. Mind-blowing as a trip back to the ’60s, the Atmospheric RG LED is a unique DMX lighting fixture that combines a 30 mW green laser and an 80 mW red laser with a 3W blue LED wash to create a truly “hip”-notic free-flowing effect. Great for projecting onto dance floors, walls and ceilings, the Atmospheric RG LED’s red and green lasers produce spacey, spidery web-like patterns, while its ethereal dark blue LED wash sweeps like amorphous clouds across the background, giving the effect a whole added mysterious dimension. This Yin/Yang-like layering of laser and LED effects is mesmerizing to the eye and will instantly transform any venue or event into a surrealistic trance-like environment. With beam angles of 70° for the lasers and 66° for the LED, the Atmospheric RG LED can cover a lot of territory, washing an entire room or dance area in its dreamlike ambience. And since both of its lasers are FDA-approved (in the United States), this one-of-a-kind atmospheric effect can be used safely in any installation or application. 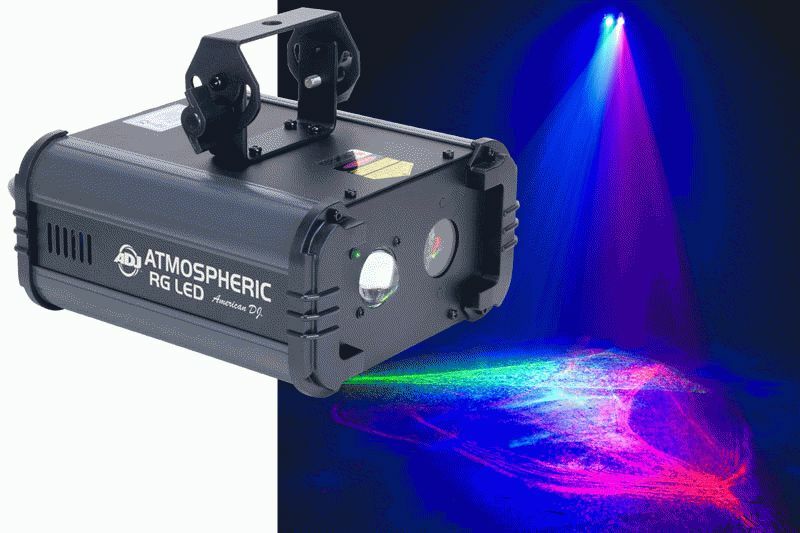 For all the drama and complexity of its stunning effects, the Atmospheric RG LED is surprisingly easy to use. It’s ready to go right out of the box, with pre-programmed sequences that can be run “plug-n-play” in Sound Active Mode. The unit can also be operated in DMX Mode, using any standard DMX-512 controller, to create more elaborate light shows. It runs on 2 DMX channels and features a digital display with 4-button menu for easy navigation through DMX settings. For larger venues, the Atmospheric RG LED is linkable in Master-Slave Mode via 3-pin XLR connectors. It features IEC In & Out for daisy-chaining power to connect up to 24 units. As an added convenience, the fixture is equipped with a 1/4” input for an optional American DJ UC3 remote control (sold separately), allowing the Atmospheric RG LED to be controlled wirelessly from a distance. durable metal housing designed to take the bumps and knocks of life on the road, so mobile entertainers and DJ’s needn’t worry about protecting such a worthwhile investment. As an added bonus, the fixture’s blue LED features a very long life, rated at 50,000 hours, and the whole unit is very energy efficient, consuming just 13 watts of electricity. Equipped with a hanging bracket for easy mounting, the Atmospheric RG LED includes a safety hook on the rear panel for extra security.